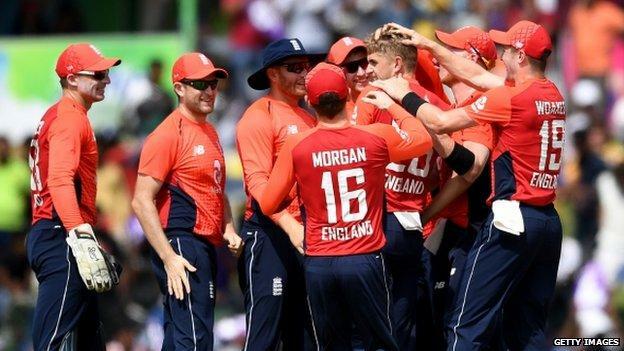 Eoin Morgan, Joe Root and Chris Woakes impressed as England won a rain-affected second one-day international against Sri Lanka in Dambulla. Morgan (92) and Root (71) were the only batsmen to pass 30 in England’s 278-9, Lasith Malinga taking 5-44. Sri Lanka were unlikely to overhaul that target after falling to 31-4 – Woakes taking three wickets. Thisara Perera and Dhananjaya de Silva rallied, but Sri Lanka were far behind when a storm curtailed play. 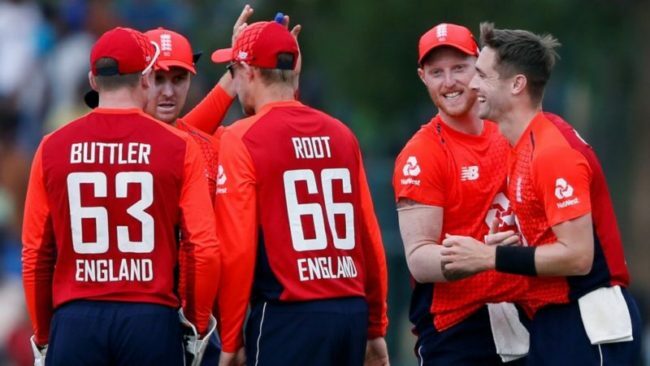 After the first game in the five-match series was washed out, England’s 31-run win – on the Duckworth-Lewis-Stern method – puts them 1-0 up with three to play. The third ODI takes place in Kandy on Wednesday at 10:00 BST. That England, who are ranked number one in the world, reached a competitive score was predominantly down to the nous and ingenuity of their senior batsmen. Both Test skipper Root and white-ball counterpart Morgan played measured knocks – the former finding the gaps and running hard between the wickets, while the latter kept the scoreboard moving with some more forceful blows. Root took responsibility after the early loss of Jason Roy for a duck and was particularly dismissive of Malinga, hitting the veteran for three successive fours early in his innings. The first was steered through backward point, the second pushed into the leg side and the third was a glorious back-foot drive through the covers. The right-hander was dropped on 48 by De Silva and capitalised to make yet another half-century, the 29th of his ODI career, before he looped a leading edge into the covers for 71 – much to his obvious frustration. Morgan, in contrast to Root, was able to find the boundary more frequently – striking 11 fours and two sixes in a knock which appeared certain to end with the captain raising his bat to celebrate three figures. However, Malinga got one to stick in the pitch and Morgan offered a simple return catch to the Sri Lankan, who went on to decimate England’s lower order with his repertoire of slower balls and yorkers. His dismissal of Moeen Ali – bowled for a first-ball duck – was his 500th in international cricket. Morgan’s side are a settled unit heading into next summer’s World Cup on home soil and it is perhaps only in one area where they may tinker with their line-up. In their effort to find a strike bowler of considerable pace, the selectors have brought in Warwickshire’s Olly Stone for this tour. And the 25-year-old impressed as he regularly clocked 90mph. His maiden international wicket was an eye-catching one as he hurried Niroshan Dickwella with a short ball that grazed the batsman’s glove on its way through to the keeper at head height. Woakes, while not as quick, gained his wickets with nagging accuracy, expertly exploiting the assistance in the pitch which Malinga had earlier found. Sri Lanka did recover from 31-4 and 74-5 to reach 140-5, but they were unlikely to challenge England’s above-par score and can have few complaints with the end result. England’s rise to number one in the world has often seen the power hitters grabbing the headlines. Today’s win, however, owed much to the other sides of England’s one-day renaissance – namely well-managed accumulation with the bat, canny bowling and outstanding fielding. Having said this week he would drop himself if he thought it would benefit the team, Morgan showed why that notion is currently unimaginable. His 92 from 91 was brilliantly paced in humid conditions, and the vital glue in England’s innings. With the ball, England look to have found an exciting prospect in Stone. The Warwickshire seamer visibly unnerved the Sri Lankan top order as he bowled at 90mph-plus. And Woakes again showed why he’s so important to this side. Three wickets – all caught behind the stumps – were the product of quality seam bowling on a surface not conducive to lateral movement. England Test bowler James Anderson on The Cricket Social: “I was really impressed with Olly Stone. “His first ball was an absolute jaffa that seamed away from the left-hander. For someone to show that amount of confidence in the first game in which they have bowled, when there are going to be nerves, was really impressive. “We all knew he had good pace but if you can’t hit the right areas and trouble batsmen then it’s not that effective. But he was really effective today. “Although Chris Woakes got three wickets, I thought Stone was the pick of the bowlers. England captain Eoin Morgan: “It’s been frustrating since we arrived because of the weather but it’s satisfying to get a result. We weren’t at our best today, which is understandable, but to get a win when you’re not at your best is a positive. Sri Lanka captain: “Credit to England, they played some outstanding cricket especially when bowling. We competed really well when bowling, and apart from the first seven or eight overs when batting we competed really well. The energy in the field was good to see, and was a plus point today.